Killer Croc (Waylon Jones) is a fictional character in the DC Universe, an enemy of Batman. Created by writer Gerry Conway and artist Gene Colan, he first appeared in Detective Comics #523 (February 1983). In Croc's initial string of appearances--a Detective Comics story arc that culminated in Jason Todd adopting the mantle of Robin--he was depicted as an unnamed, shadowy figure in a trenchcoat. A ruthless criminal whose ambition was to become the crime kingpin of Gotham, Croc worked behind the scenes using methods like sniping to eliminate his criminal competitors. He briefly united a small army of Batman villains under his leadership. When Batman finally confronted his mysterious foe, the villain's massive physique and reptilian appearance, as well as the alias "Croc", came as a surprise for the reader as well as the Dark Knight. It was then revealed that his real name was Waylon Jones, born with a form of atavism that imparted him with reptilian traits. His parents grew to loathe their child's hideous appearance and brutal behavior. While still an adolescent, his father abandoned him in the wilderness. Croc survived, becoming a remorseless sociopath. Batman and the new Robin managed to defeat him after a desperate battle. In these original, pre-crisis appearances, he resembled a powerfully-built man covered entirely in green scales, but was still basically human in his facial proportions and build. Over the years, writers have discarded the original conception of Croc as a crimelord—-for instance, it was originally Killer Croc that gunned down Jason Todd's parents, but this was later retconned to make their murderer Two-Face. His appearance and personality have become increasingly bestial, explained in the comics that his disease has slowly robbed him of all identifiable human traits. In his most recent appearances, he has an elongated snout and tail. In Batman #489, Killer Croc attacked a shopping mall where Batman and Robin arrived later. After delivering several blows to Croc, Batman was distracted by a glimpse of Bane; Croc then grabbed Batman and tried to break his back. He failed, and Bane pitted himself against Croc, breaking his arms. He was then put back into Arkham Asylum. However, it should be noted that Jean-Paul Valley was standing in for Bruce Wayne as Batman in this issue, as Wayne had been suffering from chronic fatigue syndrome at the time. When Bane helped get everyone out of Arkham in the Knightfall saga, Croc went to get revenge on Bane. While in the sewers, he smelled Bane and went after him, but only found Robin. Bane then attacked him but the ledge they were standing on broke and the three fell into the sewers. The fight ended up as a draw. In a storyline that ran in Batman #521 and #522, Croc is summoned by a paranormal force to break out of Arkham and make his way to the Louisiana swamps. Batman follows him there, only to find that the mysterious force is actually Swamp Thing, who offers Croc a place in the swampland where he can finally give in to his animal side and live free from human persecution. Killer Croc has appeared in both the Hush storyline and its chronological follow up, Broken City. In the former, he is infected with a virus that greatly increases the rate of his devolution. In 2005's Detective Comics #810, Killer Croc attempts to cure his condition. When the doctor fails, Croc devours her. In Infinite Crisis, Croc became a member of Alexander Luthor, Jr.'s Secret Society of Super Villains. In the One Year Later storyline, Killer Croc is discovered feeding on the remains of Orca. He next shows up in Countdown #50 in Arkham. He breaks free from his shackles and attempts to kill Jimmy Olsen, who uses elastic powers to escape. Killer Croc is then subdued. He is later seen among the exiled supervillains in Salvation Run. After the Martian Manhunter was defeated, Croc suggests that he eat him. Lex Luthor tells him not to and then tells him to eat something else. In DC Universe #0, Killer Croc can be seen as the member of Libra's Secret Society of Super Villains. In Final Crisis #4, Croc is turned into a Justifier. In the Battle for the Cowl storyline, Killer Croc is recruited by a new Black Mask to be a part of a group of villains aiming to take over Gotham. Jones was born with a condition resembling epidermolytic hyperkeratosis, a disfiguring skin disorder. However, it is actually a form of regressive atavism, meaning that he has inherited traits of ancestral species of the human race, such as reptiles. This condition has been augmented by the presence of a metagene. Consequently, he has several extraordinary physical abilities relating to his endurance, strength, and speed. His skin is hardened to the degree that it is nearly impenetrable to ordinary forms of abrasion including high caliber weapons fired from a distance. He possesses a degree of super strength; for example, he was able to tear a bank vault door off of its hinges with minimal effort. He has demonstrated regenerative powers allowing him to heal and restore lost limbs and teeth. He possesses superhuman reflexes and speed, especially while he is moving underwater. Killer Croc also has an enhanced sense of smell. In recent years, Killer Croc has been portrayed as being much more reptilian than in past incarnations. An action figure made by Kenner in 1998 featured a tail and dinosaur-like feet. When Mattel got the license to make DC products in the early 2000s, they released their own version of Killer Croc, sculpted by Four Horsemen Studios. This version also featured a tail and dinosaur feet. In late 2005, a re-release of this figure was modified so that the tail, along with his shirt, was removed. This version also sports a more "human" head. The 2002-2003 Batman storyline Hush featured a more bestial Croc who had been mutated against his will to appear more reptilian. This version of the character was drawn by artist Jim Lee. In the graphic novel, Joker, written by Brian Azzarello and artist Lee Bermejo, Croc is portrayed as a thug, a large, muscular African American man with a scaly skin condition. Of all his previous designs, this is the most human. He is missing his abnormally long snout, tail, and claws. However, the book seems to hint that this Croc enjoys feeding on human flesh ("Croc has a certain... eccentric way with evidence", is one way the narrator of the story, Jonny Frost, puts it). Croc is seen as leading a gang of black thugs, and later being a high level member of Joker's newly formed gang. This vision of the character is not unlike the one from Azzarello's previous work on Batman, Broken City (although Joker is non-canon). 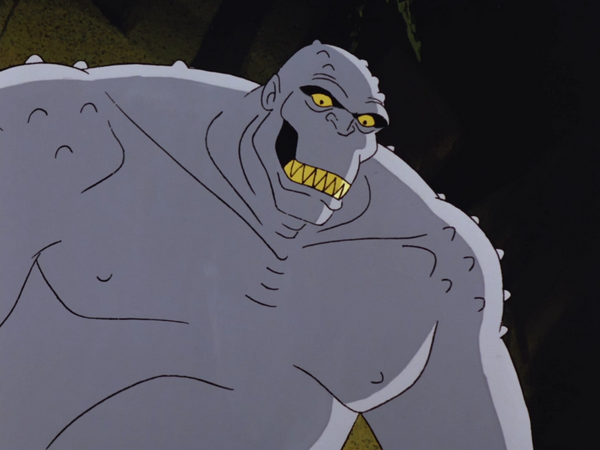 Killer Croc appears in several episodes of Batman: The Animated Series voiced by Aron Kincaid. Waylon Jones is a former pro wrestler who turned to crime. In this series, he is given lumpy gray skin as opposed to his normal green, teeth filed to points, and his reptilian appearance is toned down somewhat. Moreover, the character is far less formidable, as his chief assets--his strength and toughness--provide him with no real edge over Batman, who consistently trounces him with relative ease. In the episode "Vendetta", he runs afoul of Harvey Bullock, who arrests him. Croc later escapes from prison and seeks revenge by framing him for the abduction of criminals Spider Conway and Joey "The Snail." In another episode, he escapes from prison and flees through the countryside, taking refuge in a town of naively trusting circus carnies (including a "seal boy", a giant, conjoined twins, and a hunchbacked ringmaster). Although he begins to have second thoughts about it after they treat him like a family member, Croc plans to betray and kill his hosts for the money they have stored away for supplies. He mentions sardonically that, if left alone and to his own devices, he will still "act like himself." In this episode, it is established that Croc is legally sane, and therefore is to be sent to Blackgate Penitentiary instead of Arkham Asylum. In the DC comic The Batman Adventures, Croc reveals that his mother died when he was born, and that he was raised by his cruel aunt. Later in the series, Croc would serve as comic relief. In the episode "Almost Got 'Im", a group of villains are discussing how they almost defeated Batman. While everyone else describes almost killing Batman with some kind of complex deathtrap, Croc proudly proclaims that he once threw a rock at Batman. After a prolonged awkward stare from the other villains, he added: "It was a big rock..." It was later revealed though that it was Batman in disguise. In the episode "Trial", when Batman is put on trial by all the prisoners he's put in Arkham, Croc is among the kangaroo court shouting "Hit 'im with a rock!!" Killer Croc appeared in The New Batman Adventures episode "Love is a Croc" voiced by Brooks Gardner. Killer Croc has been revamped with a bulkier build and green scales and skin. He joins forces with the criminal Baby Doll. They go to live in the sewers, committing crimes planned by Doll and carried out largely by Croc. Baby Doll falls in love with him, until she overhears Croc boasting about manipulating her. Enraged, she betrays him to Batman and Batgirl and, in the ensuing fight, he is defeated after being drenched in boiling water. He makes his final appearance in the later episode "Judgment Day", where he is seen trying to get the Penguin to fence stolen jewels. That episode villain, the Judge (Two-Face in disguise), attacks and defeats him. Killer Croc appears in The Batman voiced by Ron Perlman. In this version, Croc is even more reptilian than past versions and has a tail. He appears to be much stronger than Batman and much like a crocodile, he's able to stay underwater for long periods of time. His origins are mostly unknown: one of his henchmen tells Batman that there are different rumors: that he is a military genetic experiment gone awry, that he deals with the wrong kind of voodoo magic in the swamps, he is simply a circus freak (it is never explained which, if any, story is true). He recruits three criminals (two of them are referred to in the credits as Vic and Freddy) as henchmen to help him flood Gotham City. This animated version also speaks with a Cajun accent and has two pet crocodiles to do his bidding. Batman later deprived him of his air supply enough to be taken down and left for the police to arrest him and his henchman (remarking that "Crocs may like water but they're no fish"). He later returns as part of the Penguin's Team Penguin. Killer Croc and his henchmen later appear as one of the captive victims of Rumor after he ambushed him and his henchmen in their hideout. Croc makes his final appearance in "The End of the Batman" where he, the Penguin, Ventriloquist, and the Joker team up to commit a crime spree now that they are under the protection of the vigilante Wrath. Killer Croc appears as one of the villains in Batman: Gotham Knight, in the segment In Darkness Dwells. In this version, Waylon Jones is a cannibalistic serial killer. The urban legend in the segment goes that he was an infant born with a disfiguring skin disorder, and that his mother abandoned him in the sewers of Gotham City. As an adult, he files his front teeth into points to compliment the reptilian appearance of his skin and becomes a circus sideshow performer. Later, Jones - now called Killer Croc - goes on a killing spree that eventually lands him in Arkham Asylum. There, his homicidal impulses intensify during treatment by Dr. Jonathan Crane, who infects him with his fear toxin. Croc escapes from Arkham and flees to the sewers along with Crane (now known as The Scarecrow) and a handful of escaped Arkham inmates. When Scarecrow orchestrates the kidnapping of Cardinal O'Fallon, Croc infiltrates the church and carries him down into the sewers. Batman comes to investigate, and Croc attacks him, biting him and infecting him with the fear toxin that is coursing through Croc's own body. After a lengthy battle, Batman fends off Croc by shoving a smoke grenade into his mouth. This version of Croc is noticeably less intelligent than other animated versions, as he never speaks and seems to just follow Scarecrow's orders. Killer Croc also appears in Lego Batman: The Video Game. Ben of Game Informer writes that "this game is filled with cool playable characters...Nightwing, Joker, Killer Croc, Bane, Catwoman, and Man-Bat only scratch the surface of the game's catalog of great characters." Killer Croc appears in Batman: Arkham Asylum voiced by Steven Blum. The video game portrays him as far larger than he has ever been before, with his in-game biography listing him as eleven feet tall and weighing five hundred and eighty pounds with massive teeth protuding over his jaws, but with a more humanoid appearance overall. He generally stays in the sewers for most of the game, until Batman must enter the sewers to acquire samples necessary to stop the Joker's plan. Killer Croc is set to appear in the upcoming video game DC Universe Online. In the novel Batman: Knightfall and Beyond, based largely on the comics storyline, Killer Croc is said to have suffered from "a raging skin cancer" that turned the outer layers of his flesh into a hardened covering when he was younger. He escapes from Arkham Asylum when Bane and his men destroy it, freeing most of Batman's major foes in the process as part of a plan by Bane to wear him down before Bane himself "breaks" him. Batman later defeats Croc in a one-on-one fight in the sewers, crushing a cylinder of knock-out gas against the underside of his nose to disable him. Croc is then arrested and held in Blackgate Prison with the other Arkham escapees until the asylum can be rebuilt.